American Civil War Gold Double Eagles have been highly favored by collectors and investors due to their intriguing historical background. As a result, demand has seen enormous growth in recent years to reflect the rarity of these quintessential American coins. Gold coins from this era have always been a hit among our readers due to the immense interest in the Civil War. So, today we have a limited selection of Civil War Double Eagles available exclusively for ASI readers. Aside from their intriguing historical significance, these coins are highly valued for their beautiful features and coloring. In 2011, the Sesquicentennial (150th anniversary) of the beginning of the Civil War was observed. Civil War-related collectibles were suddenly thrust into the spotlight, and this was felt intensely on American gold coins. Many veteran observers of the numismatic market felt that, as of 2011, prices were way under market. 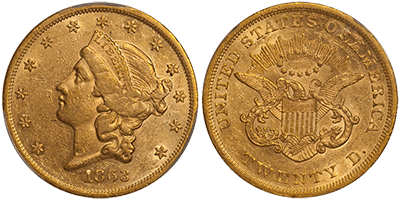 Within Civil War coins, Double Eagles, which contain nearly an ounce of pure gold, are especially popular among many subsets of specialized collectors and investors. Even more importantly, they are attractive and incredibly historic. The following issues constitute a complete 12-coin set of Civil War Double Eagles; however, most investors start with a 5-coin set containing one coin from each year. To help you get started on your Civil War collection, our rare coin expert, Doug Winter, has found two coins he believes are currently some of the best values of this year. Nonetheless, below is a list of the coins found in a full set, as well as a brief comment about their availability. 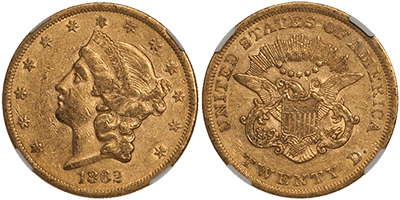 The incredibly popular Liberty Head Double Eagles produced during the Civil War remain favorably priced compared to all-time highs. Unlike the Quarter Eagle, Half Eagle, and Eagle denominations, there are no great rarities that make a set of these coins impossible—or extremely difficult—to complete. Our rare U.S. gold coin expert, Doug Winter, is widely-recognized and has written the standard reference book on Type One Liberty Head Double Eagles (1850 through 1866). This month, Doug found a limited selected of Civil War Double Eagles specifically for ASI readers, so you can get started on—or add to—your Civil War set. The 1862 is the rarest collectible Philadelphia Type One Double Eagle and is also popular due to its Civil War issuance. While sometimes seen in the lower to medium AU grades, most examples are bright and baggy with zero originality and minimal eye appeal. This is a lovely, high-end example with a 100% natural “Euro” appearance, featuring deep russet overtones accentuated by darker color on the relief details. The underlying surfaces are lustrous, and the strike is sharp with all the fine details fully visible. There are some scattered abrasions in the left obverse field, but we have seen inferior 1862 Double Eagles graded AU55. Since 2011, there are only four Auction Prices Realized (APR) for this date in AU53, and all are for NGC coins without CAC approval. The prices realized range from a low of $15,890 back in March 2014 to highs of $18,800 set in March 2015 and October 2015. This date is not often seen in grades higher than AU53 to AU55, and higher-end AU’s are expensive. A nice AU53, such as this example, represents the best value grade for this coveted date, and this specific coin should garner some serious attention from Type One enthusiasts. The 1863 is the third rarest Type One Double Eagle from Philadelphia after the 1859 and the 1862. It is not often seen in the median AU grades, as evidenced by the fact that just three AU53s have been auctioned since early 2010, as well as four AU55’s since late 2012. This nice AU example is lustrous and shows less wear than one might expect a large-sized gold coin from this era to possess. There are some typical bag marks seen on the obverse with most of these clustered in the center of the left field—the reverse is cleaner and grades a full AU55 on its own. Both sides show nice orange-gold color with some pale green shading beneath. Only two PCGS AU53 1863 Double Eagles have been sold at auction since 2008, with the last APR reaching $18,800 in March 2017. For most collectors, the sensible grade for this rare, coveted Type One issue is either AU53 or AU55, as a nice AU58 coin will cost around $30,000—if you can even find one. Because of their famous historic origins, Civil War Double Eagles have a particularly high demand among investors and Civil War enthusiasts alike. These coins represent incredible value and are a great way to own a piece of American history. To add these beloved Civil War gold coins to your portfolio, or to complete a full set of Civil War Double Eagles, please call us at 800-831-0007 or email us. *Prices subject to change based on market fluctuation and product availability. Prices reflected are for cash, check, or bank wire. Offer expires Wednesday, November 22, 2017.